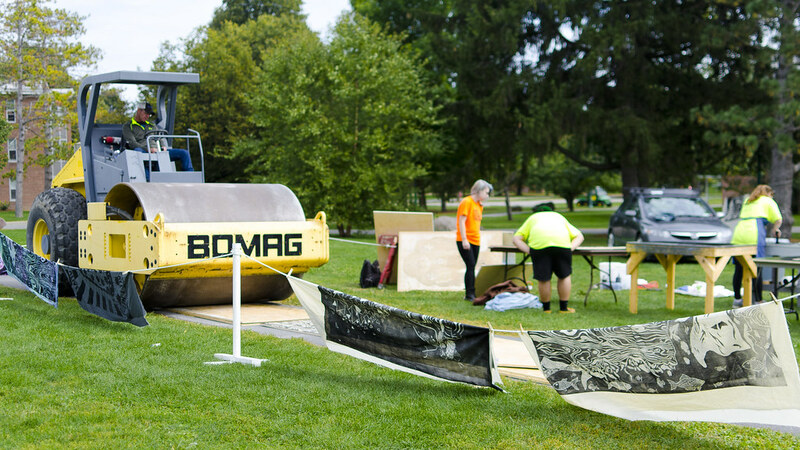 When the time came to make the really big prints in Prof. Melissa Schulenberg’s Advanced Printmaking course at St. Lawrence University, only a steam roller had significant- and even-enough pressure to produce the best result. The breezy afternoon, the green foliage, and the bright yellow steam roller on a placid college campus makes for one serious juxtaposition in the middle of winter. Wonderful. You’ve got to do what you’ve got to do. Artists really don’t mess around! True. Looking the Boyes Hot Spring Wonder Project I’ve been posting it is confirmed. WOW! Wish we’d done this when I took printmaking at Potsdam State!